I don’t ever remember not liking clam chowder. 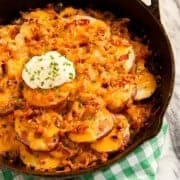 Even when I was a kid, and not quite sure if clams were good or not, I still liked the overall flavor and aroma, and didn’t mind scooting a couple big pieces of clams to the side to spoon up the rest. Now I eat it all, of course, always wishing there were more and bigger clams, and even bigger bowls. Since visiting Nantucket earlier this month, I can now say that clam chowder, specifically this New England Clam Chowder with Salt Pork Belly, now lives within my heart. The National Pork Board invited me to spend a couple days with them to attend their annual Pork Crawl, and that’s how I found myself eating a warm mug of this homemade chowder just off the shore of Nantucket Harbor one evening. To say that my time in Nantucket was memorable feels like an unfair and inadequate description. But words fail me. Nantucket is one special place. It’s a destination that wasn’t on my radar. Not even one little bit. I had to look it up on a map to make sure I even knew where it was. But now? Now I hope that I can return one day with my family, to share this island with them and get more acquainted with its New England splendor. I hope you like this clam chowder, too. 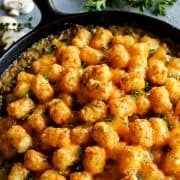 The recipe comes from Stephen Gerike, the Director of Food Service Marketing for the National Pork Board. Stephen made a pot of chowder using large fresh chowder clams called quahogs, and served it to us in big white mugs. Sadly for me, living in the landlocked state of Minnesota, I could not find any clams as large as those after stopping at three local stores. Seeing the desperation in my eyes, the man behind the last fish and seafood counter I stopped at took me into the heart of the store and placed two cans of baby clams in my hands. He said, “Just trust me, this is what I use when I can’t get chowder clams. It’ll get you by until you find them.” So that’s what I used, which obviously made this chowder even easier to make. I’ve included Stephen’s instructions for using chowder clams, though, for any of you with access to them. And for the day when I find them waiting for me at the store. Wash the clams to remove any sand or grit. Place them in a large steamer pot with one quart of water under the steamer basket. Steam the clams over high heat until they have just opened. Remove the clams as they open and place them in a bowl, making sure to dump all of the liquid from the shell before removing them. Once all of the clams have opened, turn the heat off and strain the liquid from the bottom of the steamer into a clean bowl. Remove the clams from their shells, leaving the adductor muscles attached to the shell. These are very tough in large clams and aren’t fun to chew. Discard the shells and strain the liquid remaining in the bowl, adding it to the liquid from the steamer. Coarsely chop the clam meat into ½” pieces and set them aside in a clean bowl. If using canned clams, drain them, reserving the juice. Set aside. Use a 12-quart enameled cast iron pot or Dutch oven to make the chowder. Place the pot over medium heat and add the salt pork and onions. Stir for several minutes, until fat begins to render and the onions are soft and just beginning to brown. Remove the potatoes from the water and add them to your pot, stirring them into the salt pork and onion mixture. Fry for two to three minutes. Add herbs and salt the potatoes lightly. The pork is salty but it helps to season the potatoes now so they absorb the flavor. Add the reserved clam broth (or the reserved clam juice from draining both cans of clams, plus 1 quart chicken broth) to cover everything by 2 inches. Bring the chowder to a boil and turn down to a simmer. When the potatoes are just tender, add the chopped clams and season generously with freshly ground black pepper. Turn the heat up to high until it returns to a boil, then remove it from the heat and serve. Serve boiling hot in a mug with oyster crackers. Adapted from Stephen Gerike of the National Pork Board. Before I show you the beauty of Nantucket and the enormous amount of pork I managed to eat (which I’m quite proud of), let’s get a couple housekeeping items taken care of right away, ok? #1 – What the heck is a Pork Crawl?! I’ve since learned so much more about what the Pork Crawl is, and with one under my belt, am so excited to be able to share it with you. 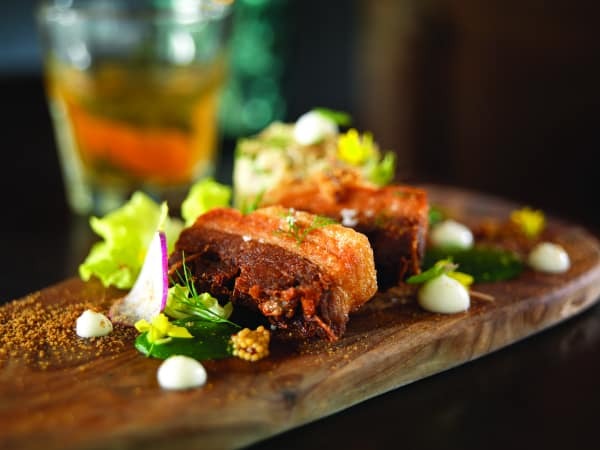 In 2010, the National Pork Board noticed that pork was a super hot protein on independent restaurant menus, with talented chefs using pork in increasingly interesting ways. The National Pork Board wanted to get food service trade editors to eat those dishes and meet those chefs. In the past, they picked one or two chefs and brought them to New York for desk side visits. But then they decided to change it up, to do something more exciting, more engaging. The team behind the Pork Crawl was already familiar with pub crawls and thought they could make the concept work for bites of pork, too. Hence the Pork Crawl concept was born. 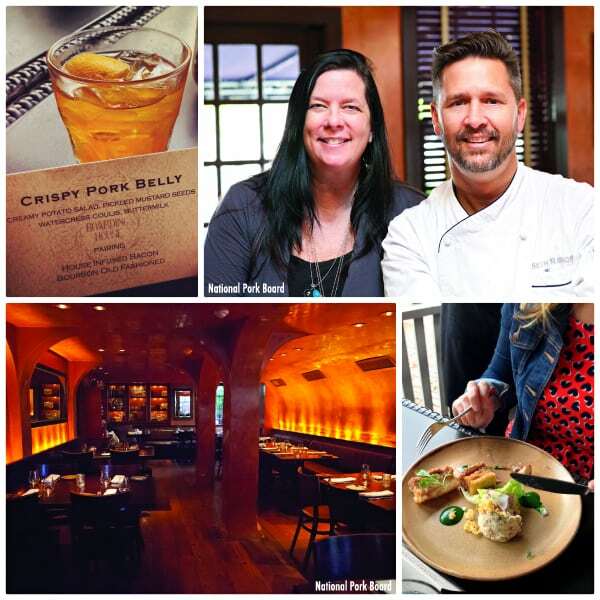 The first Pork Crawl was held in Chicago in the fall of 2010, with Chef Host Paul Kahan. 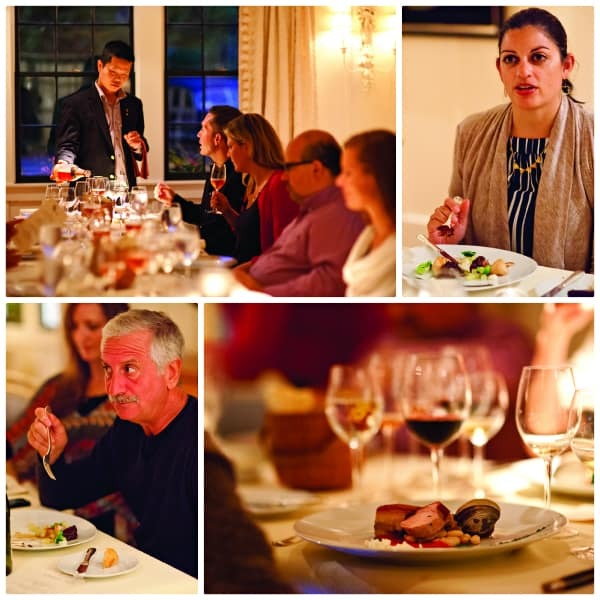 A few weeks later, they hosted a Philadelphia crawl with Chef Host Jose Garces. Although the crawls were a hit, the team decided that two crawls in one year was asking too much of their editorial and chef friends, so in subsequent years they’ve held one crawl per year. 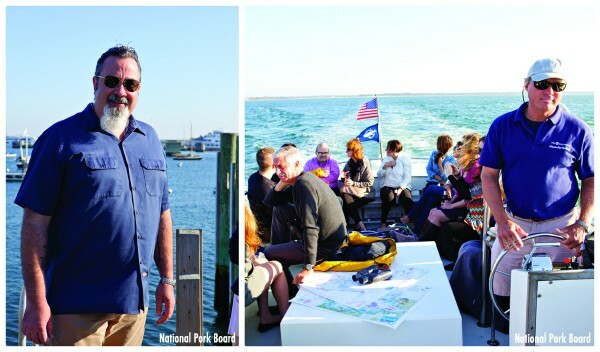 In 2011, the National Pork Board took editors to Portland, OR; in 2012, Richmond, VA; and in 2013 they made Nantucket the destination. Oh, lucky me! 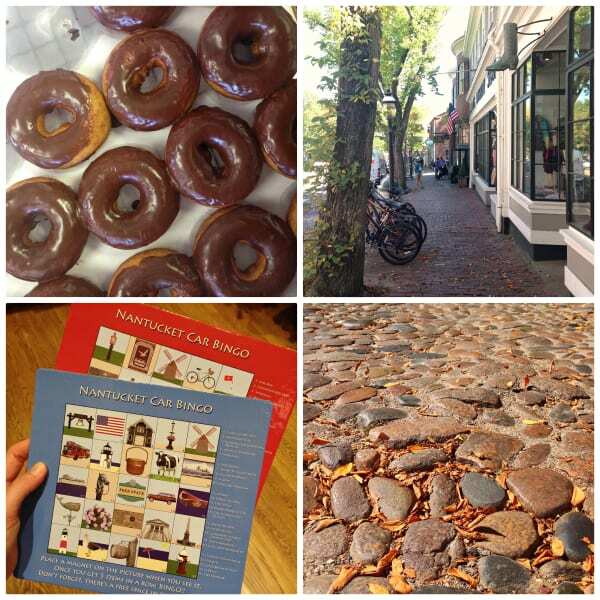 #2 – Where IS Nantucket, anyway?! The other tidbit of information I want to share is of geography. 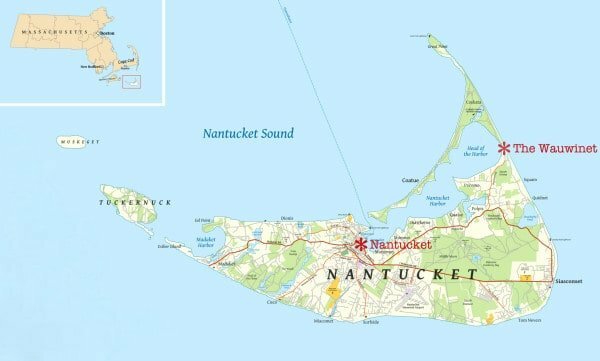 Because most people have a vague idea of where the island of Nantucket lies, but then are somewhat surprised when they actually seek it out on a map. It is 27 miles from the Massachusetts mainland, 14 miles long by 3.5 miles wide. For me, this trip to this location was truly a gift. It’s a place I never knew I needed to visit, and I’m now feeling so blessed to have been there. If you ever get the chance, I highly recommend spending some time there. And if you keep reading, I’ll help you out with where you should make dinner reservations! I flew from Minneapolis to Boston, and then on to Nantucket. I was told that my flight from Boston to Nantucket would use a “smaller” plane, but I was not prepared for the teeny tiny vessel I was led to. 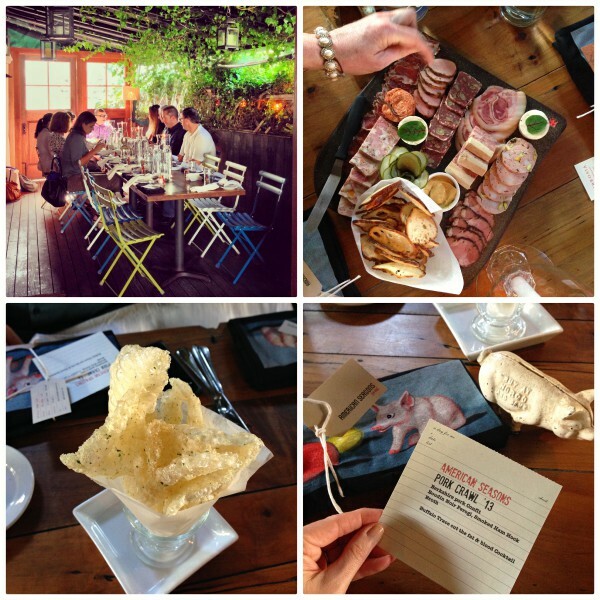 With 10 seats total, this Pork Crawl thing was off to one adventurous start! I frantically sent off a photo and text to a few very special peoples back home (you know, in case I didn’t make it…), and boarded with all the excitement of a brand new thrill ride. The takeoff at dusk was awesome, with an orangey-pink sunset on the horizon, cut out with blackened silhouettes of Boston. The evening quickly turned black and the coastline became even more incredible. I had never been to this part of the US, so flying over Cape Cod and seeing the intricately drawn lines of Atlantic Ocean meets North America, with all its inlets and peninsulas and islands, was truly fascinating. 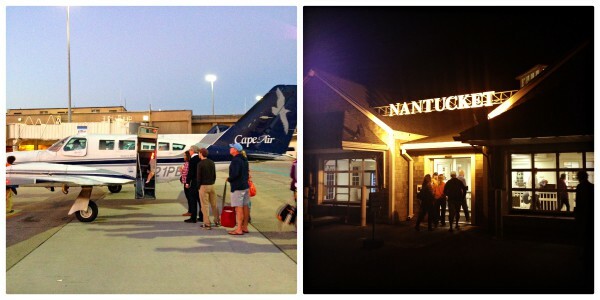 And then landing at the quaint little Nantucket airport…well, that was just too sweet. I spent three splendid nights at The Inn at White Elephant Village. The Inn was sophisticated, yet completely charming and inviting with natural elements everywhere, and an always-smiling staff that remembered my name. My suite was one of only 20 rooms in The Inn, and very comfortably furnished. It consisted of a bedroom with a king size bed outfitted in beautiful linens and a fabulously fluffy duvet that I never wanted to leave, a separate sitting area, and an envious bathroom with a separate shower and soaking tube. 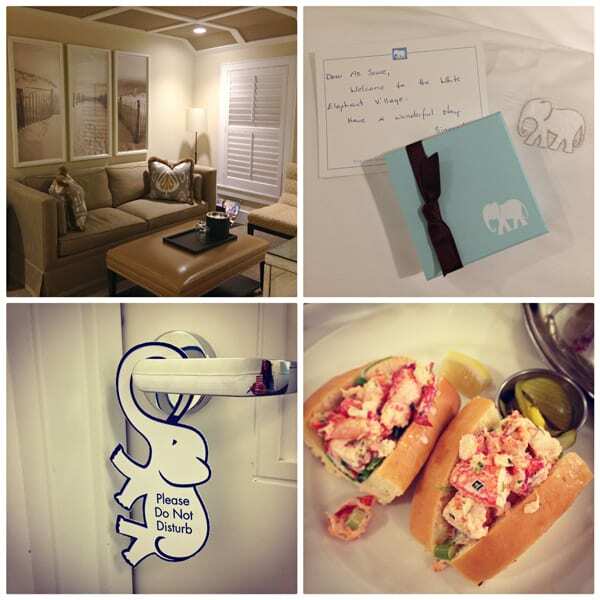 Upon my arrival that first evening, I promptly hung the “Please Do Not Disturb” elephant on my door by its trunk, read the personal welcome on my pillow, and nibbled on the little box of delicious chocolate covered cranberries that I soon found sold all over the island. Then I opened up the room service menu and zoomed in on all things fish and seafood. Before leaving Minnesota, I made a vow that when I wasn’t eating pork in Nantucket, I’d be eating fresh deliciousness from the local waters. That lobster roll my first night, all sweet and uber buttery, was enjoyed in my pj’s with audible “mmmmm’s”, for the sake of my ears only. I had some free time my first morning on the island and followed a recommendation for breakfast at The Downyflake, famous for its doughnuts. Then I hit the cobblestone streets of downtown Nantucket for a little shopping. I had to take a picture of the Car Bingo cards I found for playing on Nantucket. Its nautical landmarks were so very different from the cards in our own car! 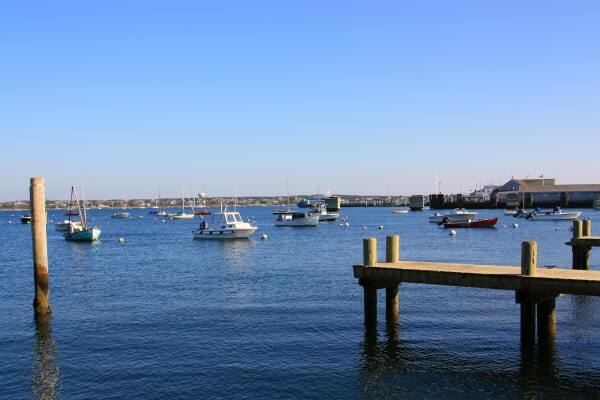 Nantucket is an island, a county and a town – the only place in America with the same name for all three. “ACK” is the 3-letter code for Nantucket Memorial Airport. But it has also affectionately become shorthand or slang when referring to Nantucket. Nantucket has no traffic lights, neon signs, or fast food restaurant chains. The entire island is a historic district designated as a National Historic Landmark, with more than 800 houses still standing that were built before the Civil War. Like a magnet, I was drawn to the water. The Straight Wharf area was lined with great restaurants and quaint shops. Gorgeous ocean-worthy vessels lined the harbor, such a feast for Midwestern eyes. I spent quite alot of time just walking the docks, checking out the boats, and marveling at all the fishing gear some of them packed. It was fun to take a peek inside one of the waterside shops selling fresh fish and seafood. To kick off our time with the National Pork Board, our group walked to Children’s Beach, a very short distance from The Inn at White Elephant Village. We were about to spend an evening together before the Pork Crawl officially started the following afternoon. 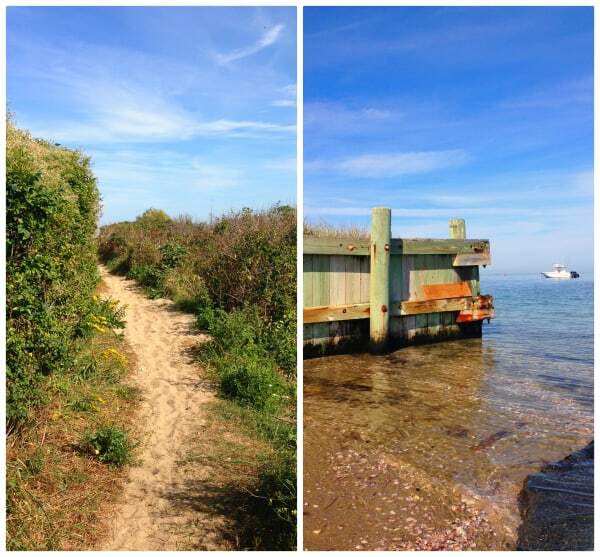 The bottom photo on the left shows an oyster farm, not far from The Wauwinet. Stepping off the boat to this wild natural beauty was a scene I wasn’t quite expecting. 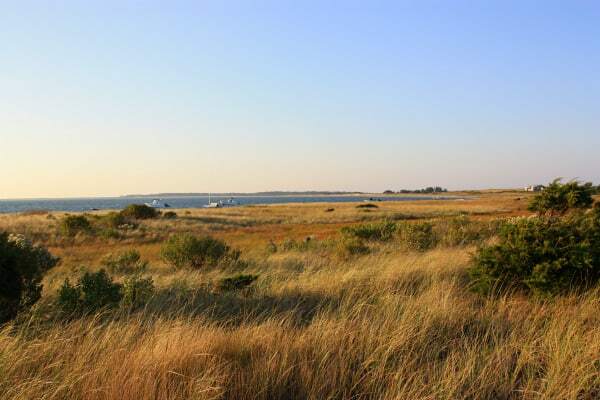 The Wauwinet’s landscape is breathtaking, with a pristine coastline. We were greeted with champagne and hors d’oeuvres on the shore as the sun was settling into the horizon. Ahhhhh…The Wauwinet, all beautiful and golden, its face warm and glowing in the setting sun. 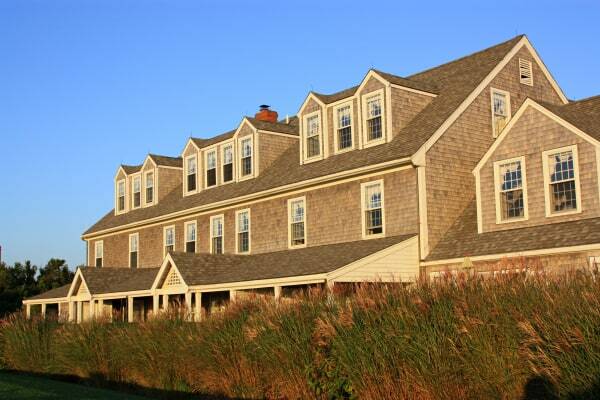 This historic inn features 32 guest rooms and 4 cottages. As a member of the prestigious association of Relais and Châteaux, The Wauwinet is recognized worldwide for its superior service, outstanding cuisine, and luxurious accommodations. While enjoying fresh-from-the-bay oysters at Topper’s, one of the nation’s most acclaimed restaurants, we were introduced to Chef Kyle Zachary. Known for his innovation and attention to detail, we all knew that we were in for a treat. Chef Kyle and Stephen each demonstrated their own versions of clam chowder. This is where the recipe for New England Clam Chowder with Salt Pork Belly comes from in the first part of this post. Per Stephen, it’s “the original pork and seafood pairing”. The private dining room at Topper’s was dimly lit with a soft golden glow. Head Sommelier Hieu Tran talked about each bottle before pouring, and brought about many nods of approval when sipped paired with Chef Kyle’s stunning dishes. Topper’s boasts a wine collection of 1,450 bottles from around the world, carefully selected by Cellar Master, Craig Hanna, who has been with The Wauwinet for 23 years. Topper’s received Wine Spectator’s Grand Award in the 2013 “Restaurant Wine Awards” for the 17th consecutive year, being one of only 13 or so restaurants worldwide to receive this top honor. 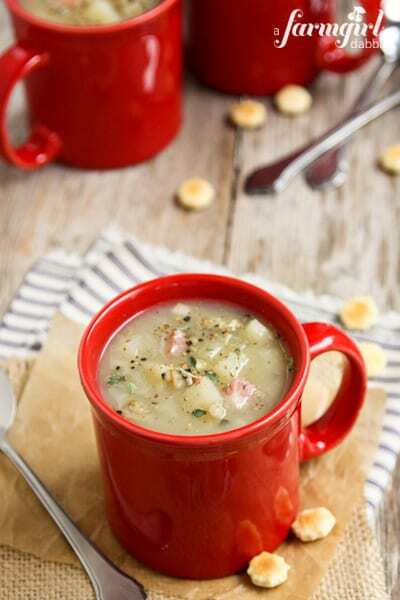 Stephen’s version of New England clam chowder was pure comfort served in mugs, and easily attainable for home cooks. Chef Kyle’s bowl (above) was all about a chowder of sophistication. His Restyo Oyster Chowder was velvety smooth, with potato confit, tender leeks, and crispy smoked trotters (amazing!!). The next three courses were equally amazing. Studded with pops of vibrant colors and flavors, with a variety of textures, Chef Kyle’s creativity aptly portrayed how beautiful pork can be. *I always love a story or interesting tidbit take-away… Grey Lady Ale is named after Nantucket, affectionately referred to as the “Little Grey Lady of the Sea” because of its gray-shingled buildings and frequent fog. The next morning I had some free time before meeting up with everyone again for the Pork Crawl. I took off walking, past the harbor, past the Coast Guard station, to the Brant Point Lighthouse, standing stout at just 26 feet tall. The point was natural and beautiful, with deep sand, swaying grasses, and colorful wildflowers. This is the point where the ferries pass, transporting visitors to and from the mainland. A wide stretch of sand all the way around the point boasts of shells too plentiful to count. I was wishing our daughters were with. They could have played there for hours. The island is so beautiful! Leaves were just beginning to turn. 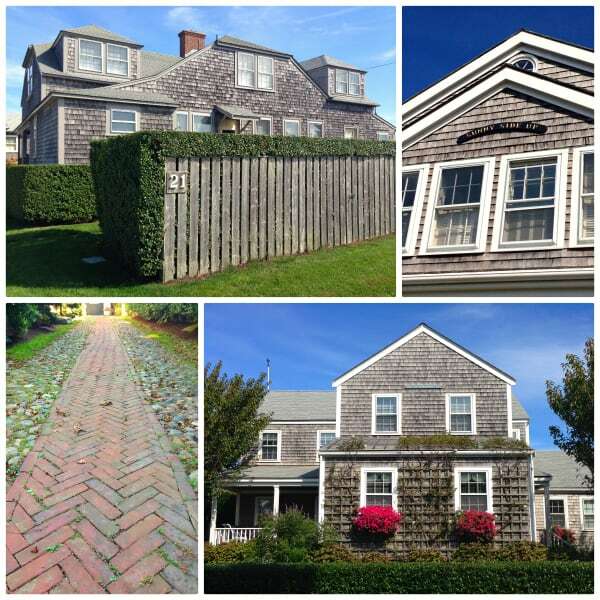 I can only imagine how striking Nantucket is in its full color glory. From the point, I jogged back inland a bit and meandered through the residential streets, all decked out in traditional New England style. It was fun to see that each home was named, liked the boats in the harbor. And I loved the unique personalities repeatedly found in fences and driveways. Our group set out on foot to our first of nine – yes, NINE – stops on the 2013 Pork Crawl. First stop was American Seasons with Chef/Co-Owner Michael LaScola and his wife/Sommelier/Co-Owner Orla Murphy-LaScola. Chef Michael was the local host of the Pork Crawl and spent the remainder of the day with us. 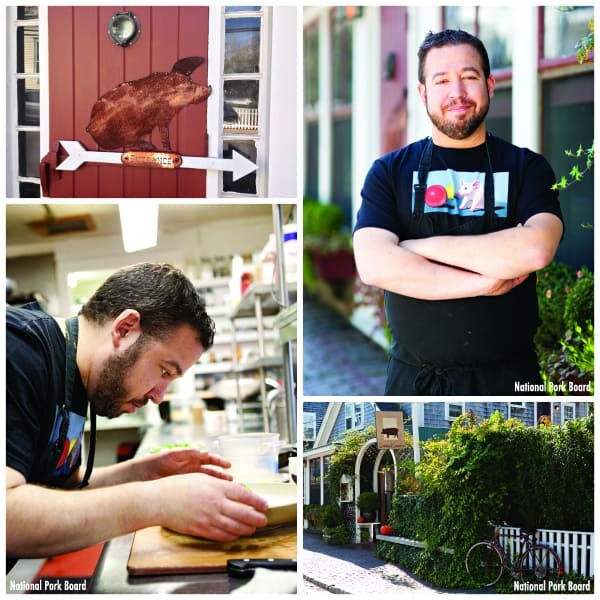 He is dedicated to regional and seasonal produce, and really loves his pork, utilizing nose-to-tail cuisine. 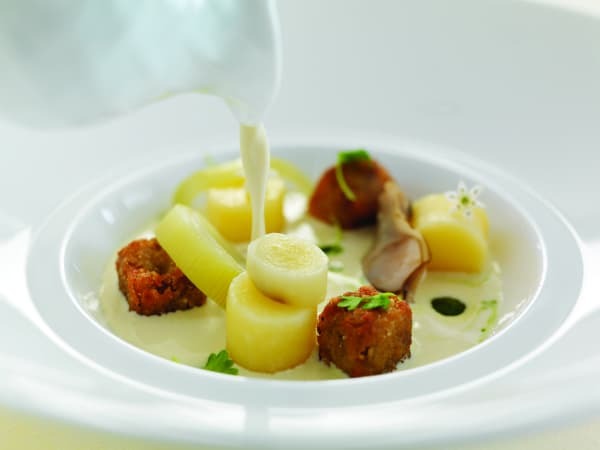 Together, Chef Michael and Orla have claimed numerous awards in both food and wine. We were seated under a sweet outdoor covered patio, climbing lush with ivy. A large platter of charcuterie, made in-house by Chef Michael, was placed on the table as “Buffalo Trace Cut the Fat & Blood” cocktails poured into jelly jars were set before us. Chef Michael’s Berkshire Pork Confit with Boudin Noir Perogi and Smoked Ham Hock Broth was a work of art, hungrily devoured. The restaurant’s name translates to “Heart of the Sea”, where husband-and-wife chef team Seth and Angela Raynor feature Latin-inspired seafood dishes, along with some pretty awesome pork. Their third restaurant in Nantucket, Corazón del Mar is the playful and informal one of the bunch, with a fun ceviche bar and brightly painted decor. 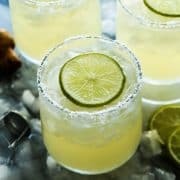 The Raynors started us out with chips and fresh guacamole, and a Bebida del Jefe (“The Boss’ Drink”) to wash it all down. This traditional brown sugar and lime daiquiri served with Flor de Cana 4-year rum was absolutely perfect with our meal. This dish was one of my favorites. 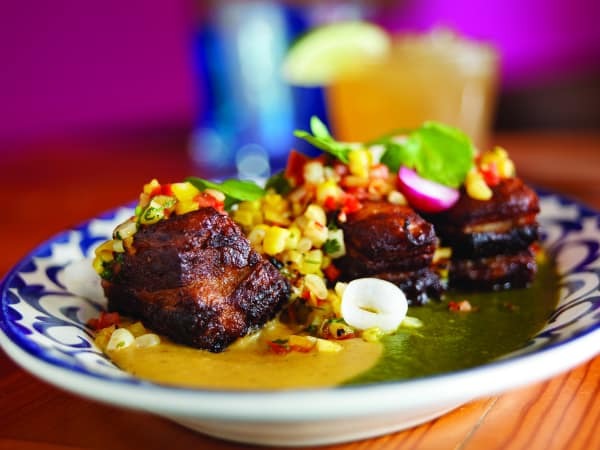 Crisp Pork Carnitas with Fresh Corn Salsa over a Plantain and Coconut Purée. 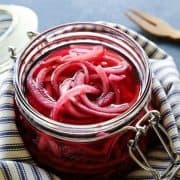 The fabulous colors are what first drew me in, but the flavors and textures are what made my heart sing. Every bite was amazing, with crispy salty pork and bright bites of corn and the most amazing pickled baby onions. The purée lent a tropical feel that was so lovely. 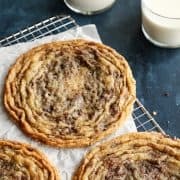 You can bet that I ate every last bite. This place made me want to take the rest of the week off, throw my phone in the harbor, and just hang out and mingle with the local scene. 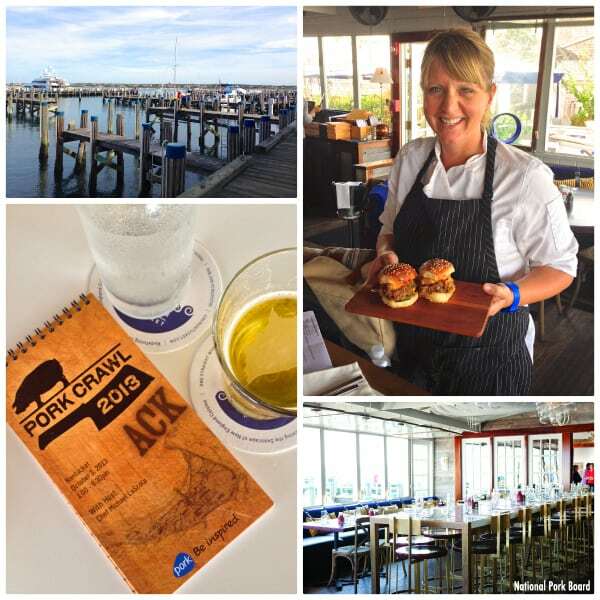 Being right on the wharf in this brightly lit space with all its windows drawn up was a breath of fresh air. The stylish nautical decor felt like an extension of the beauty outside, of the harbor’s deep blue water and sky. Since opening little more than a year ago, Cru has become Nantucket’s premier waterfront oyster bar. 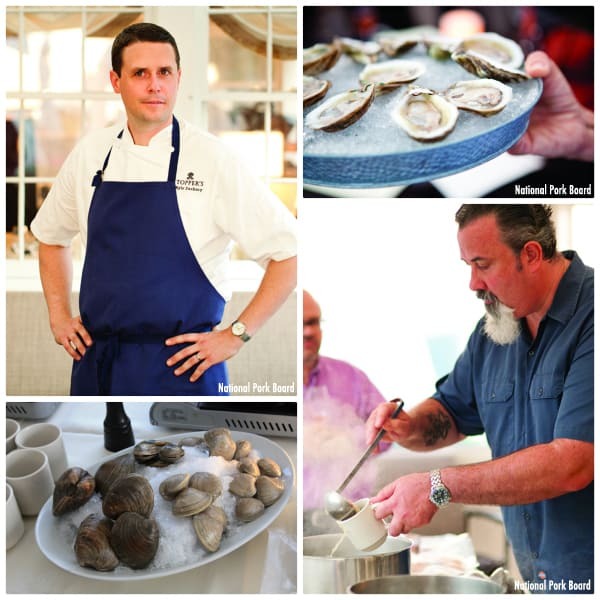 Erin Zircher, Cru’s Executive Chef and partner, has created a menu of simple and elegant New England classics, made with ingredients from local waters. Chef Erin served us Hush Puppies with Aleppo Pepper Honey and these sliders, a pork sandwich masterpiece. 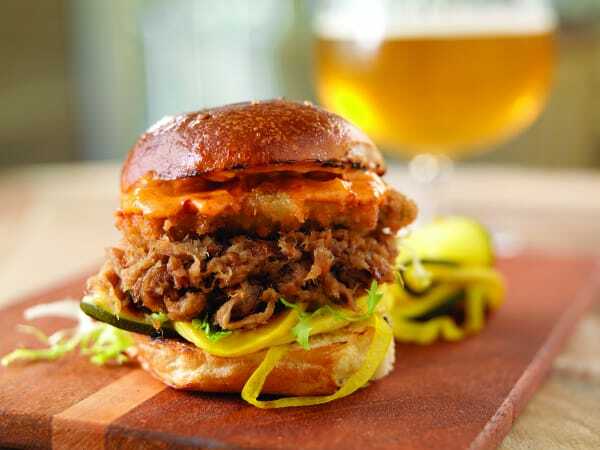 The Pulled Pork Slider was layered with smoked paprika aioli, zucchini pickles, and a fried oyster. And it was awesome. 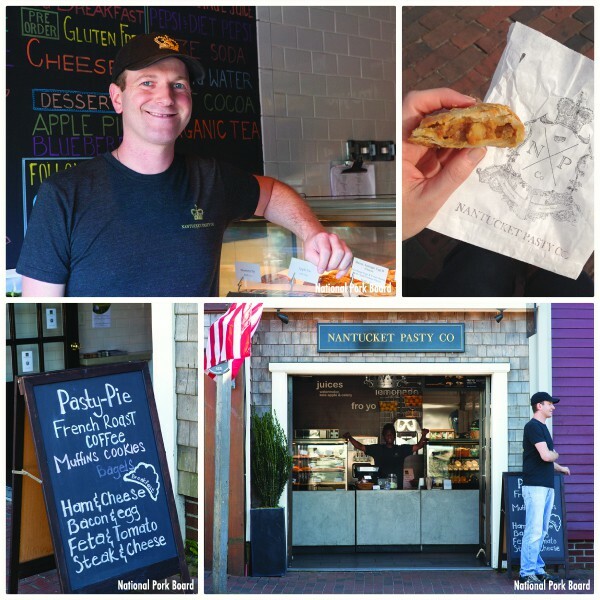 We were thankful for a beautiful fall day as we ate our pasty-pie outdoors on nearby benches here at the Nantucket Pasty Company. 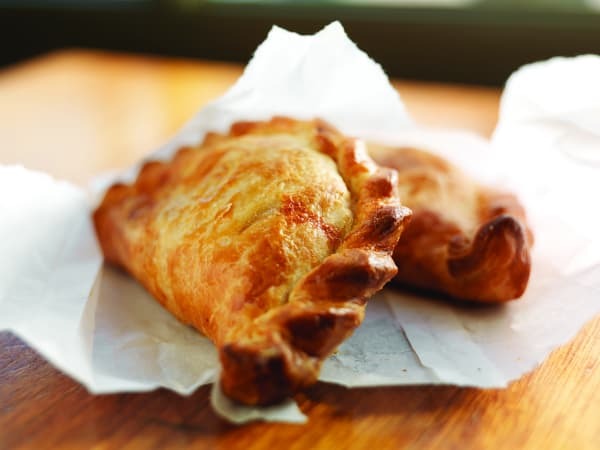 The pasty, pronounced “pass-tea”, is a hand pie traditionally filled with seasoned meat and vegetables, and is native to Cornwall, England. 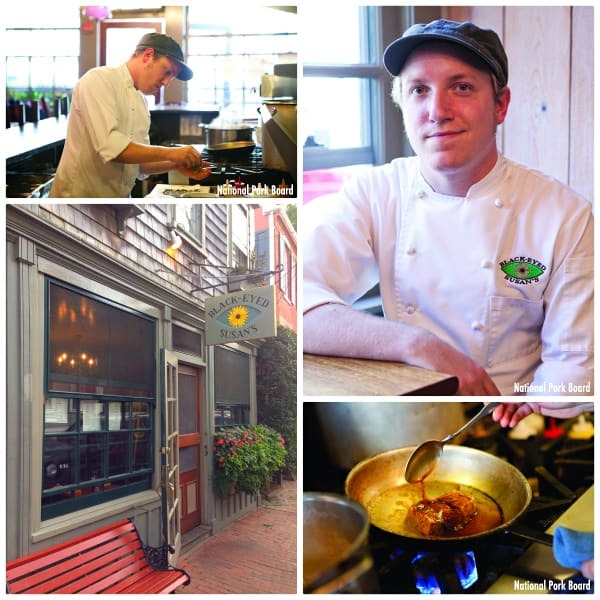 Head Chef Joshua Smerdon and owner Nathan Coe have taken pasties to the next level, however, with a focus on the local seasonal ingredients of Nantucket. Isn’t that gorgeous?! Chef Smerdon crafts flaky, buttery personal pies perfect for any meal, including dessert. He treated us to Pork Vindaloo Pasties, hot and spicy and incredibly delicious. They are the perfect hand-held lunch. Next stop on the Pork Crawl map was Òran Mór, located up a flight of copper stairs in an historic Nantucket home. Chef Chris Freeman and co-owner/wife Heather opened this intimate bistro in 2006, serving beautifully prepared cuisine focused on simple, elegant flavors. 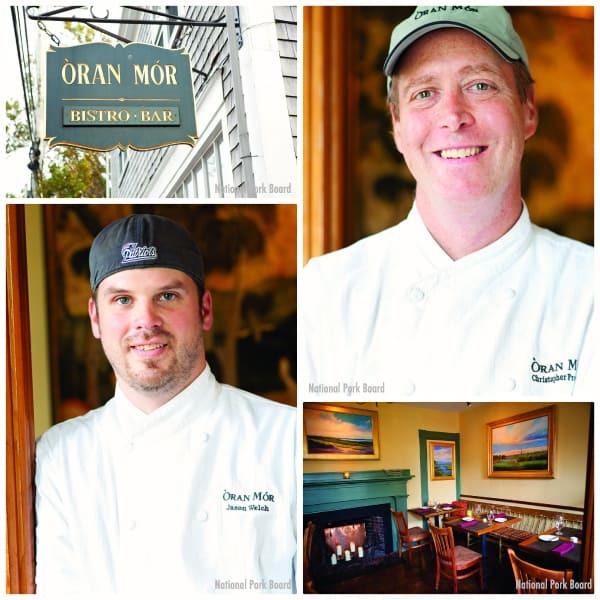 Prior to opening Òran Mór, Chef Chris spent nine seasons in charge of the kitchen at Topper’s at The Wauwinet. Òran Mór translates to “Beautiful Song” in Scottish Gaelic. At the warm and intimate bar adorned with fabulous sketches from the sea, we sipped on Apple Manhattens, handcrafted with apples macerated in Woodford Reserve Whiskey. I grabbed my opportunity to click a shot of Stephen’s forearm. 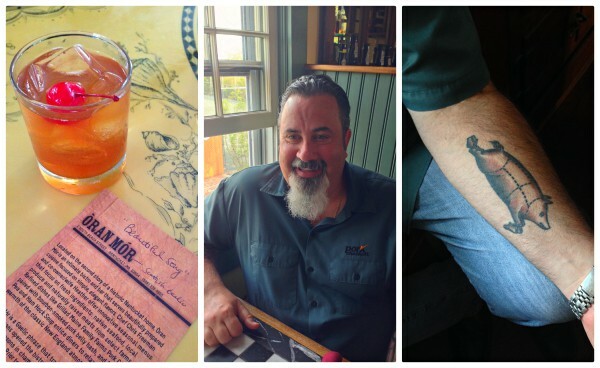 He’s passionate about pork, and you wouldn’t need to see his tattoo to figure that out. 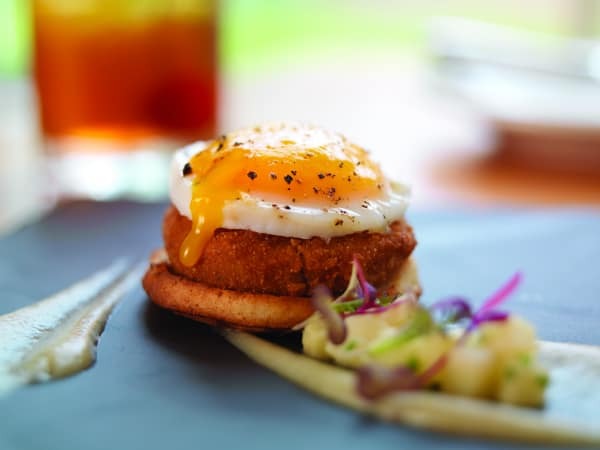 We happily accepted our plates of Cured Berkshire Pork Belly Scrapple with a Nantucket pullet egg, sitting atop a toasted cider muffin. The honey crisp apple compote was a bright crisp contrast, a nod to the current season. When I was researching Nantucket on the internet before leaving Minnesota, Black-Eyed Susan’s came up frequently. It’s been a hotspot for over 20 years, beloved by locals and visitors alike, for both breakfast and dinner. Executive Chef Jeff Worster and co-owner Susan Handy have created an eclectic bistro-diner hybrid with quirky, ever-changing menus that keep diners coming back. 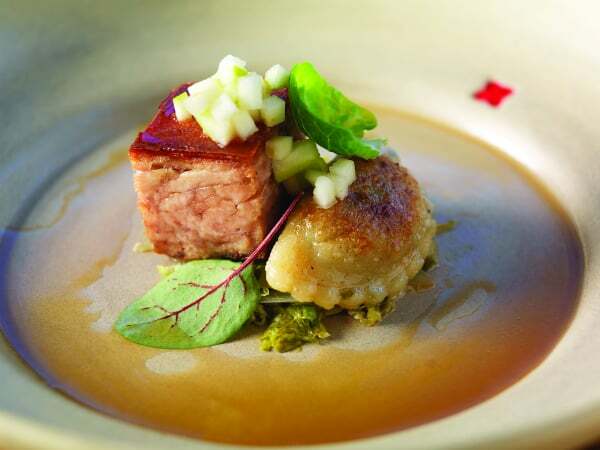 Creative pork dishes are sent out from their open kitchen by Chef Jeff and Chef Todd Edwards. 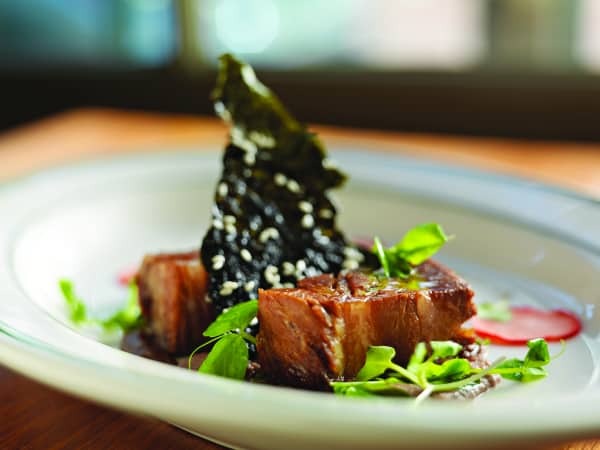 The Five Spice Braised Pork Shoulder with pickled radish and candied nori definitely stood out, warmed by the flavors in the Chinese spice mixture. Hey, that guy looks familiar! Well that’s because you saw him at Corazón del Mar. 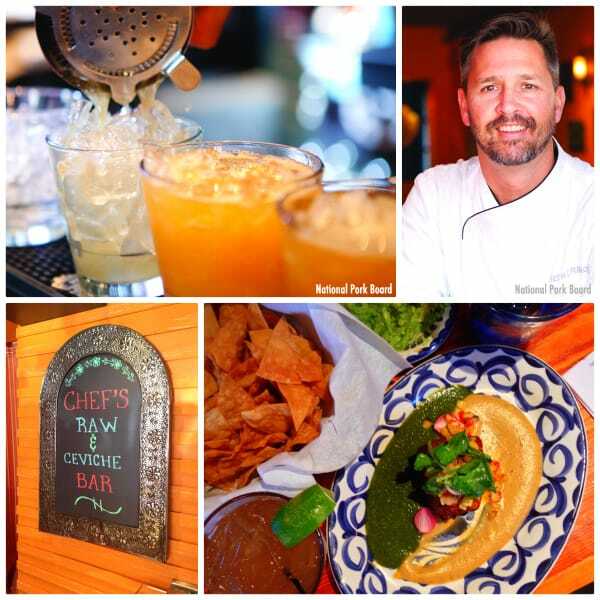 Boarding House is owned by the same husband-and-wife chef team Seth and Angela Raynor. This is their first restaurant. 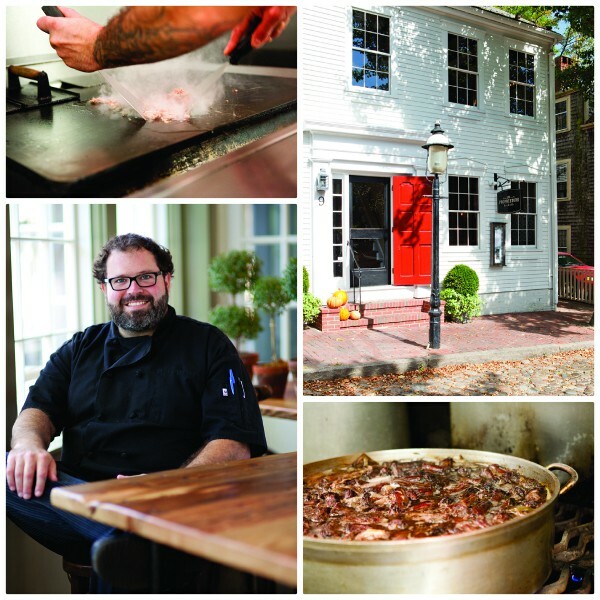 Located in the heart of the historic district, Boarding House has served the Nantucket fine dining scene for 21 years, featuring farm-to-table renditions of comfort country food. The cellar dining room was warm and intimate, washed in soft golden lighting. When I return to Nantucket some day, I’m going to eat in that fabulous space. We dined out on their patio, situated on the corner of Federal Street and India Street, with a lovely House Infused Bacon Bourbon Old Fashioned in hand. Beautiful! Chef Seth’s Crispy Pork Belly with creamy potato salad was breathtakingly beautiful. Served with pickled mustard seeds, watercress coulis, and buttermilk, this dish was outstanding. 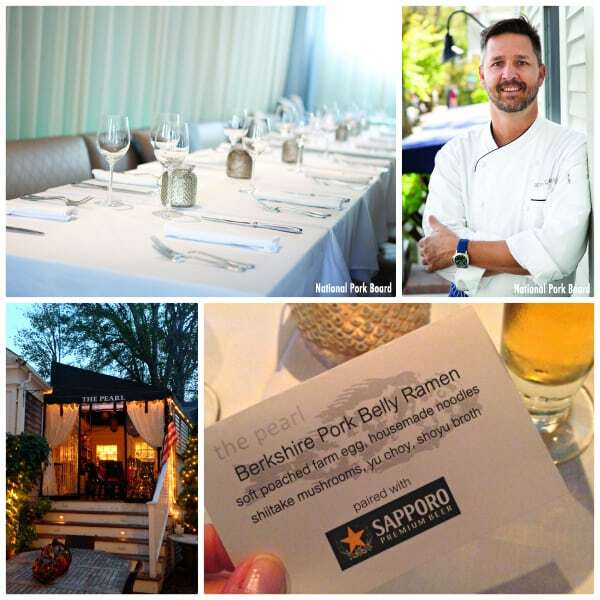 The Pearl is the third restaurant owned by Chef Seth Raynor and his wife Angela. 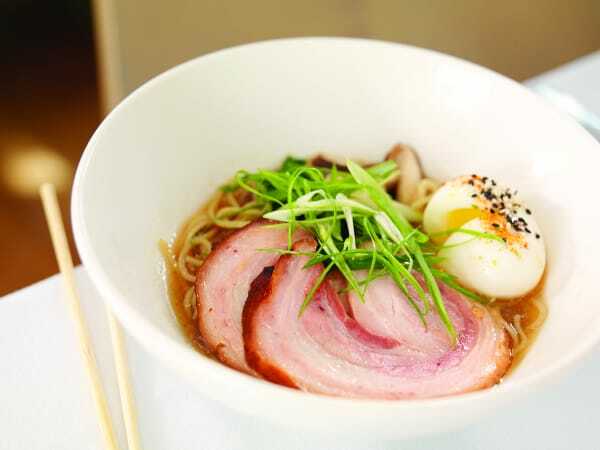 The restaurant offers modern coastal cuisine inspired by Asian flavors. The Pearl is clean and minimal, a beautiful backdrop for the exquisite, and sometimes quite exotic, dishes created by Executive Chef Seth and Chef de Cuisine Liam Mackey. Chef Seth took us on a tour through the kitchen, to the back covered porch and open patio, a wonderful space for private dining. Another favorite dish of mine was this bowl of Pork Belly Ramen with Housemade Udon Noodles, Shiitake Mushrooms, and a Soft Poached Egg. Sadly, I was at a point in the Pork Crawl (Stop #8) where I needed to slow down. I simply could not finish this amazing bowl of yum. I guess that’s what I get for boasting about finishing every last bite at Stops #1 through #7! And now, for the final stop of the Pork Crawl. 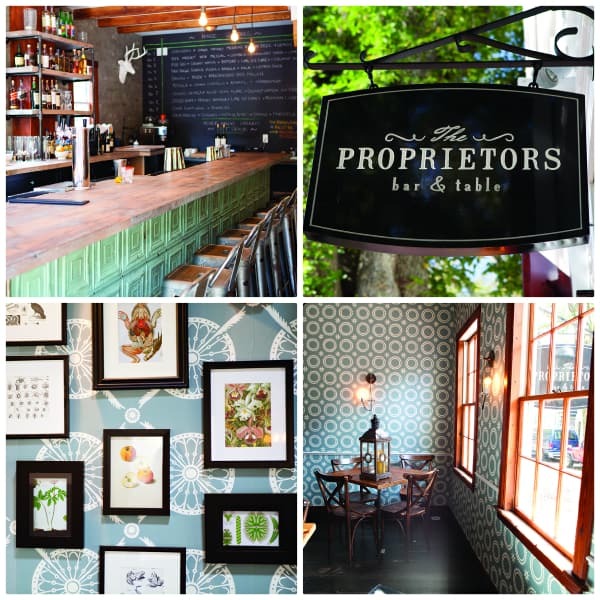 Restaurant #9, The Proprietors Bar & Table. We have now come full circle with our host Chef Michael LaScola, as he and his wife Orla are co-owners of this restaurant along with Chef Tom Berry. This restaurant had such a wonderful feel to it, designed to reflect a well-traveled Nantucket home filled with treasures from trips abroad. 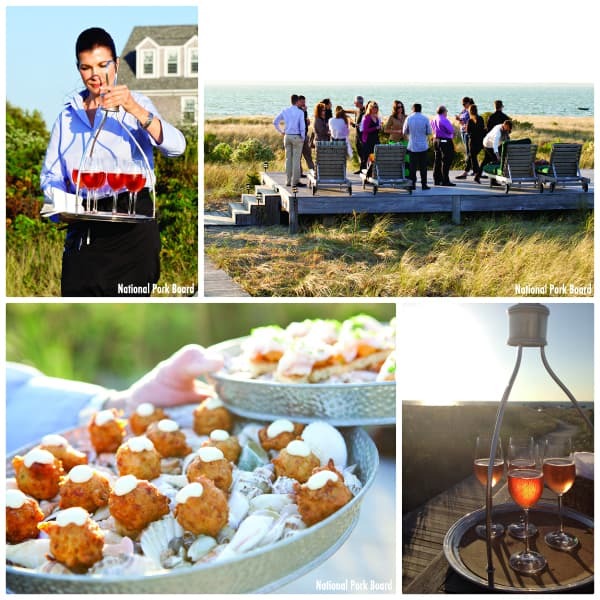 The menu reflects the same sentiment, borrowing influences and flavors from international cuisines, while highlighting ingredients harvested on small Nantucket and New England farms. 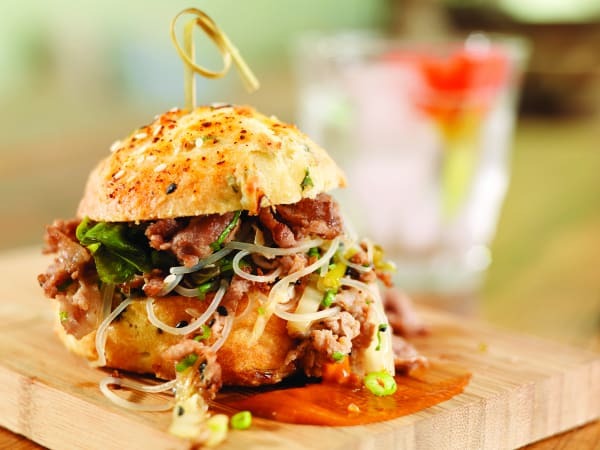 Chef Tom served us “Kung Pao” Pigtail and this fantabulous sandwich of Shaved Pork-Umms with Scallion, Sesame BBQ, and Kimchee Biscuit. It was a lovely final hurrah to a very tasty day of pork. And that, my friends, concludes the 2013 Pork Crawl in Nantucket, from my own eyes and taste buds. A great big thank you to the National Pork Board for having me as their guest. It was an absolutely amazing experience that I’ll never ever forget. 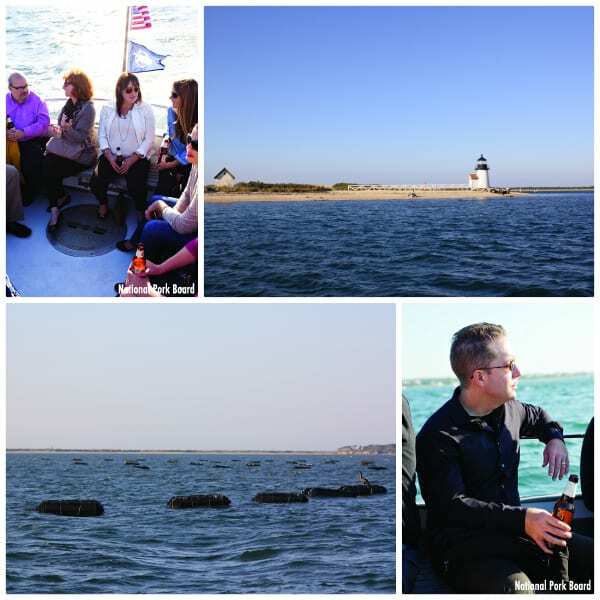 Disclosure: The National Pork Board paid for my trip to Nantucket and compensated me for my time to write about my 2013 Pork Crawl experience. All opinions are my own. What a fabulous and beautiful event! Those pictures almost transport us there! So glad you had a great time! 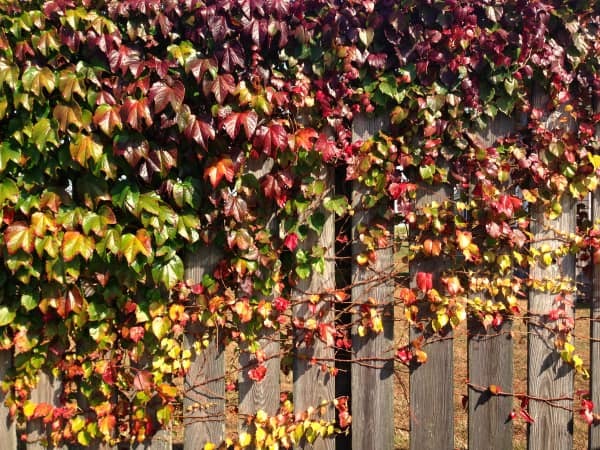 Beautiful post- thanks for sharing. I’ve never been to Nantucket. It looks beautiful! Thanks for sharing the NE Clam Chowder recipe too. Wow that is alot of scrumptious food right thar! Great re-cap! Brenda, this is a beautiful post! 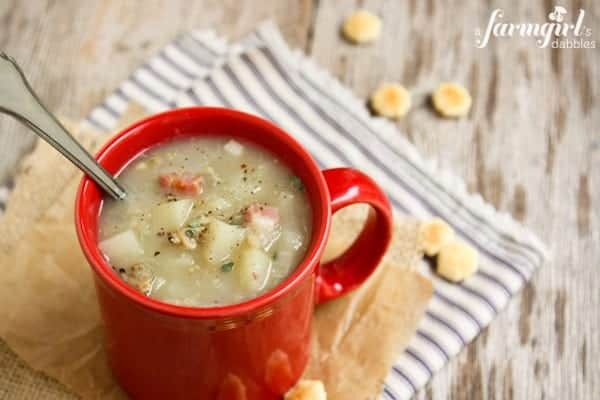 I’ve never been a huge fan of clam chowder, but your recipe makes me want to try it again. Thanks for sharing! What a beautiful place to visit! 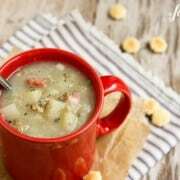 Love the chowder too, your photos and styling are perfect. Nantucket was absolutely perfect. I want to go back!! Thanks, Miss! What s fun and gorgeous trip! I have never had New England Clam Chowder, but I have to change that! 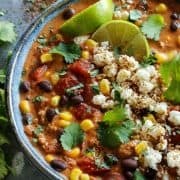 This looks so good, Brenda! Cozy, warm and just perfect for this time of year! The trip, the food, the whole experience…so excellent. Thanks, Tieghan! What a fantastic post, Brenda! The chowder looks just wonderful and all the photos remind me so much of the year we lived in New England when hubby and I were just married and he was in the Navy. It’s a lovely, lovely place. Very special. Ahhhh…how lovely to have spent a year in that area. Thanks, Lana! Wonderful post Brenda! I love clam chowder and it has been a long time since I have made it myself. 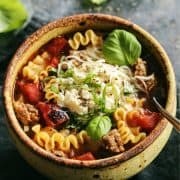 I want to try this recipe!! 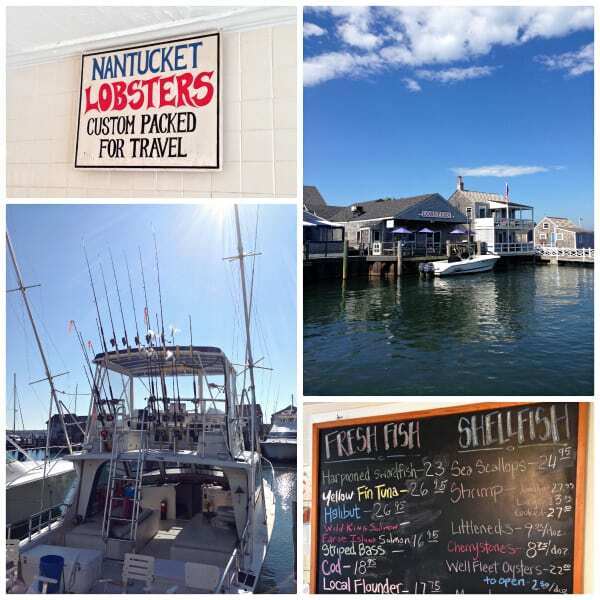 Lucky you, pretty swanky places you dined/stayed at; Nantucket sure is a gem along with Martha’s Vineyard and my beloved Cape. Hopefully, you will visit again and see more of the southeastern Mass. coastline: including the beaches, great shopping, and plentiful dining. 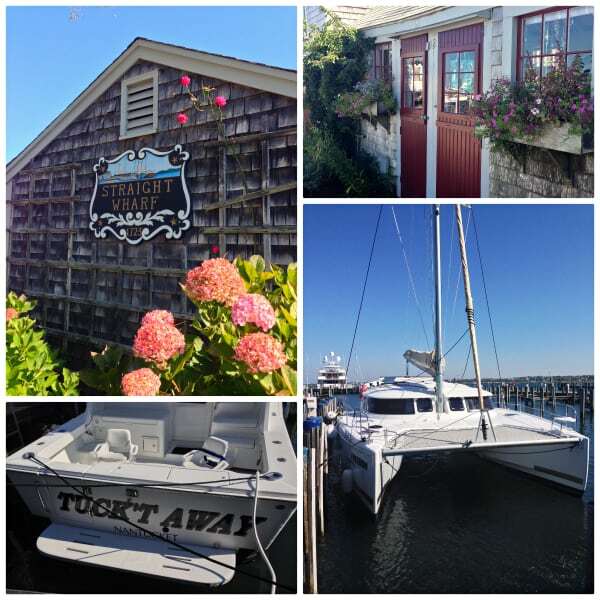 We are going on a girls’ weekend soon to Falmouth on the Cape (where you get the island ferry), and it’s my job to figure out the restaurant choices when we’re not cooking in, too many possibilities! Although I am born and raised here, I don’t like chowdah, blasphemy, I know. Glad you enjoyed all those tempting dishes. And, if you like some light reading, I recommend the novels of Elin Hilderbrand, set on, Nantucket, of course. Thanks, Paula – enjoy your girls weekend!! What a fun adventure! 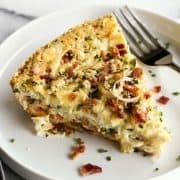 You’ve got me really craving chowdah and my New England roots now! It was SO MUCH FUN! And so incredibly tasty and beautiful. Thanks, Georgia! What a beautiful trip and beautiful photos, too. I remember my mom making Steak-Umms as a kid. Probably nothing like the pork version you had, though. I adore this recap! 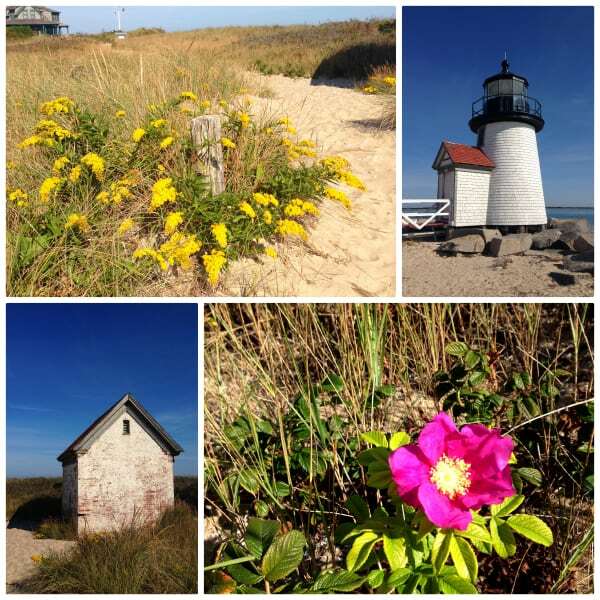 I have never been to Nantucket…it’s on the bucket list! And the chowder recipe, must be actioned! Nantucket was never on my bucket list. But now it is, to return again!! Thanks, Lauren! Oh you are making me Boston so much!!! Would you believe I’ve never been to Nantucket in my 9 years living in Boston?! Many of my college friends would live and work there during the summers and I always heard the best stories. Thank you for bringing me along on your trip!! What a beautiful recap of a lovely trip. 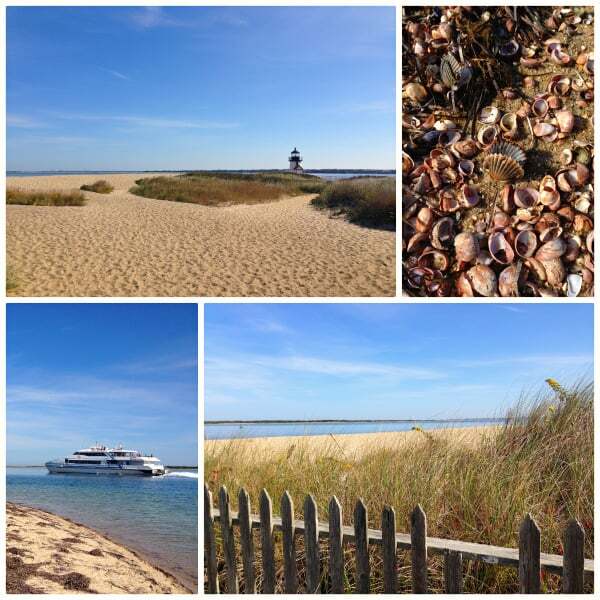 Nantucket is one spot I would love to visit in my lifetime, and your photos and narrative gave me a captain’s chair view of this amazing place. What a blessing to spend time there, and enjoy all that amazing food. Wow, Nantucket looks so amazing! Love the chowder recipe too! Nantucket IS amazing. And the chowder, too! Thanks, Angie!